The Qualitative Data Analysis Program (QDAP) at UCSUR provides a resource to the University community in all aspects of qualitative data collection and analysis. Experienced QDAP staff can carry out or assist with all phases of a qualitative research project, including study design, project management and coordination, data collection utilizing interviews, focus groups, document or Web site analysis, audio and video transcription, data coding and analysis, and results reporting. QDAP staff have the expertise to collect and manage a range of qualitative data using a variety of methods and sources. This includes conducting in-depth interviews and cognitive interviews; facilitating focus groups; and collecting qualitative data from both traditional and innovative sources, such as document and textual material; videos; images and other visual material; and Web sources such as Web sites, blogs, and e-mails. QDAP provides high-quality transcription of audio and video recordings for further analysis. QDAP staff can provide management services ranging from full project management to assistance in the management of data collection, including recruitment, screening, and scheduling of participants, depending on project needs. Using qualitative data analysis and management software, QDAP staff also can organize and manage qualitative data in preparation for analysis. Accurate and reliable coding is central to qualitative and mixed-methods analysis. 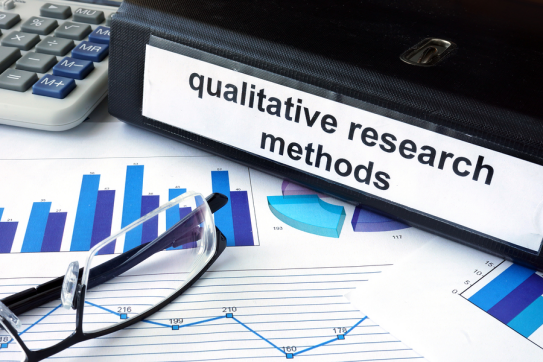 QDAP offers a rigorous approach to analyzing a variety of qualitative materials. Experienced coders deliver the data you need in a timely and expert manner from a wide variety of sources. Original material for analysis might include in-depth interviews, open-ended survey answers, field notes, transcripts from focus groups, blogs, e-mails, Web site content, videos and images, results from database searches (such as LexisNexis), congressional testimony, historical texts, and a host of other unstructured but digitized data sets. QDAP staff work with your research team to craft an analysis plan and codebook with a tailored methodology designed to code the material for key concepts and relationships. Multiple coders can quickly and reliably extract the data you need to reach valid inferences. QDAP employs University of Pittsburgh students and UCSUR professional staff trained in data collection and using qualitative analysis software. We maintain a 15-station transcription and qualitative data coding lab that uses Olympus transcription software; ATLAS.ti, a widely used qualitative data analysis software package that supports project management, enables multiple coders to collaborate on a single project, and generates output that facilitates the analysis process; NVivo, another widely used qualitative data analysis software package; Transana, a video coding software package; and a specialized in-house program for quality control that calculates inter-coder reliability statistics and simplifies adjudication of coder disagreement. In addition, we offer training seminars and one-on-one training sessions for faculty, staff, and students in using ATLAS.ti, NVivo, and Transana.